It's another win for Bill! Who would have known? Can he make it three wins in a row? This episode is all about the modal verb 'should'! That handy modal so often used for advice! How well do you know its grammar rules? It seems that someone is trying to upstage Will! Who is this mysterious Sal - and why does he think he knows better? Three questions, two contestants, and only one host can survive! Find out all in this episode of the Grammar Gameshow! Hello, and welcome to today’s Grammar Gameshow! I’m your host, Will! Run, run as fast as you can, you can’t catch me, I’m the Grammar Gameshow man! And of course let’s not forget Leslie, our all-knowing voice in the sky. 'Should'. That handy modal so often used for advice! Hello, all. My name’s Bill. Hello Will! And hello, everyone at home. It’s so great to be here tonight! 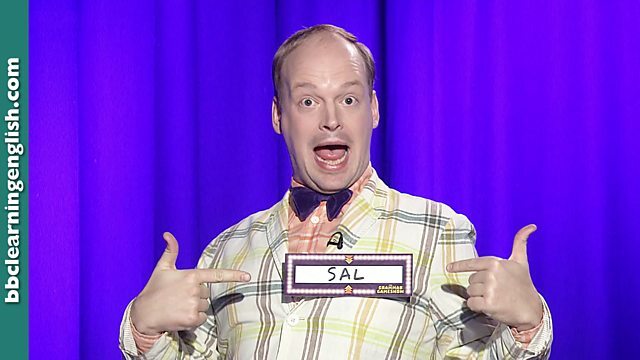 I’m your contestant Sal! Here for your viewing pleasure on the one, the only, the spectacular, Grammar Gameshow! Well, goodness, Sal. That was quite an intro. Isn’t he fantastic? Let’s give him a hand. Thanks Will. I used to host a gameshow myself for many years. And what great times they were. An old hand, eh? Great! OK. Let’s get going and don’t forget, you can play along at home too. Like many modal verbs, 'should' has a variety of meanings. Explain the use of 'should' in these sentences. Should I get the cheap one or the expensive one? Well, that’s 'should' to ask for advice or make a suggestion. She’s out but she shouldn’t be much longer. That’s 'should' for something probable or expected. Everyone should wear a seatbelt when driving. Well, that’s 'should' for advice again. Wow. You got that one spectacularly wrong. Really nose over toes there! Isn’t he fantastic? But a good TV host should never tell a guest they’ve got something wrong without softening it first. Just like this. Bill, that was a fair guess, but you got it wrong. Bad luck. But here’s a high-five for trying. Boom! Yes. Thank you Sal. I’ll take that one under advisement. Leslie? Good job! Or maybe wrong? I forget now! Anyway, 'should' is a modal verb, meaning it doesn’t change for person or time, and is always followed by a bare infinitive. It can be used to offer advice and make suggestions; talk about probabilities based on what is expected or logical and refer to obligations - such as, 'Everyone should wear a seat belt when driving' – though it’s not as strong as 'must'. Well done. Two points each. Now it’s time to.. Hold up a sec! What a champion! What poise! What precision! But here’s a quick note from someone who’s walked the walk before. Why not try it like this. Great play everyone, amazing performance! Two points each! OK Sal. Nice idea. I’ll bear that one in mind. Let’s move on to round two. 'Should' is a modal verb and so has no past form. How, then, can we use 'should' in the past? Don’t we use 'should' plus 'have' plus a past participle verb? Well done, Bill. And for a bonus point, what functional use does it have? It’s used to talk about past actions that either were or weren’t a good idea. He got the bonus point! Well done Bill! You’re a star! Hit it! You shouldn’t have done that! Sal, out of respect for a peer, I am going to let that one slide. But that is your last warning. Leslie? Well done, Bill. You get the bonus point. Hit it! Oh... Well, that one’s ruined now! On to our last round. The verb phrase 'had better' is similar to 'should'. But there are some important differences. Look at these sentences and correct the ones which are wrong. A) Both are followed by a bare infinitive. B) Both can be used to give advice. C) Both are the same degree of intensity. D) Neither includes a sense of consequence. C) is wrong. 'Had better' is more immediate and urgent than 'should'. I think D) is also incorrect. Doesn’t 'had better' include a sense of worry or danger of negative consequence if the advice is not followed? Leslie, my best buddy and pal! My best buddy and pal. Isn’t he great folks? Let’s hear it for your favourite voice in the sky… it’s Leslie. Alright, that’s the conjunction that broke the syntax. Bill: you win. The prize is a boat or something. And Sal? Maybe you should try having a catchphrase. Something like… waaah! Nope! That’s a little too long-winded for me! Release the unsatisfied audience. And Leslie? Do the goodbye bit. There, see you next time! Should and shouldn't are modal verbs. This means that they are always followed by a bare infinitive verb and do not change their form, regardless of which subject pronoun is used. He / She / It should go soon. Should and shouldn't have many uses. The choice depends on the speaker's meaning within the context of the situation. They can be used to offer advice and make suggestions, talk about probabilities based on what is expected or logical and refer to obligations – though should is not as strong as must. Advice and suggestions: What do you think we should do this evening? I think we should go to the cinema. Probability: The sky is dark so it should rain soon. I've just got in the car so I should be with you in ten minutes. Obligation: There should be no smoking inside the building. To talk about actions in the past that were or weren't a good idea, we can use should + have + a past participle verb. This structure is useful for talking about regrets or making criticisms of people's past actions. I should have applied last week. Now I have to wait another year! You shouldn't have taken that letter! You don't know who it belongs to! Had better and should are very similiar. Neither of them changes their form for a pronoun, and both of them are followed by an infinitive. They also both deal with advice. However, had better is a little more urgent and intense than should. When we use had better there is often a sense that if the advice is not followed, there will be negative consequences. This makes it useful for making a threat. That cough sounds very bad. You'd better go to the doctor as soon as possible! 'Should' and 'shouldn't' have many uses, depending on the speaker's meaning in each particular situation. They can be used to offer advice and make suggestions, talk about probabilities based on what is expected or logical, and refer to obligations. Which of these uses of 'should' does not make sense? To talk about actions in the past that were or weren't a good idea, we can use 'should' + 'have' + a past participle verb. Which of these sentences with 'should have' is incorrect? 'Had better' and 'should' are very similar. Neither of them changes their form for a pronoun and both of them are followed by an infinitive. They also both deal with advice. However, 'had better' is a little more urgent and intense than 'should'. When we use 'had better', there is often a sense that if the advice is not followed, there will be negative consequences. Which of these statements about 'should' and 'had better' is NOT true? Click on the links to download the audio and PDF document for this episode.